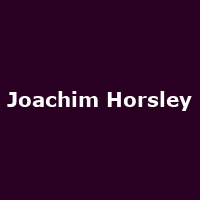 Joachim Horsley is an American pianist, composer, performer, arranger and orchestrator. He released his debut album, "Was Dead the Whole Time", an album of horror film themes, in 2014. In 2016, he released the song: "Beethoven in Havana" (Beethoven's 7th Symphony as a Rhumba), which featured Joachim on piano, with all sounds, including percussion coming from the piano.